Team Sky have admitted "mistakes were made" around the delivery of a medical package to Sir Bradley Wiggins but deny breaking anti-doping rules. The team have been unable to provide records to back up the claim Wiggins was given a legal decongestant at the 2011 Criterium du Dauphine in France. MPs have criticised the team's record-keeping, while UK Anti-Doping (Ukad) is investigating the package's contents. Team Sky say they take "full responsibility" for the failures. "There is a fundamental difference between process failures and wrongdoing," said Team Sky principal Sir Dave Brailsford. On Tuesday, Team Sky published a covering letter and supporting document sent by Brailsford to address the concerns of the Culture, Media and Sport Select Committee. At a series of hearings, the committee has sought answers relating to the package and Wiggins' use of therapeutic use exemptions (TUEs). The original allegation made to Ukad was that the package delivered by then-British Cycling coach Simon Cope to ex-Team Sky medic Dr Richard Freeman contained triamcinolone - the corticosteroid for which Wiggins, a five-time Olympic gold medallist and the first Briton to win the Tour de France, later received three TUEs, as leaked by hackers Fancy Bears. Team Sky said it is right the claim is being "investigated thoroughly" by Ukad but asserted that there has so far been "no evidence whatsoever to substantiate the allegation". In the supporting document, Team Sky say Freeman had no prescription rights to purchase the decongestant Fluimucil in France and questioned some media reports over the amount of triamcinolone ordered by the team. They also say Freeman "failed to comply with team policy" by not saving written notes to confirm Wiggins was administered Fluimucil at the time in the right place, instead storing his notes on a laptop that was reported stolen in 2014. "Self-evidently, the events of recent months have highlighted areas where mistakes were made by Team Sky. "Some members of staff did not comply fully with the policies and procedures that existed at that time. Regrettably, those mistakes mean that we have not been able to provide the complete set of records that we should have around the specific race relevant to Ukad's investigation. We accept full responsibility for this. "However, many of the subsequent assumptions and assertions about the way Team Sky operates have been inaccurate or extended to implications that are simply untrue. "Our commitment to anti-doping has been a core principle of Team Sky since its inception. Our mission is to race and win clean, and we have done so for eight years. "To my understanding, Ukad's extensive investigation has found nothing whatsoever to support this allegation, which we believe to be false. "Some of the comments made about Team Sky have been unreasonable and incorrect." Wiggins and Team Sky come under scrutiny for his use of TUEs after his confidential medical information was leaked by hackers 'Fancy Bears'. Wiggins, an asthma and allergy sufferer, received special permission to use triamcinolone shortly before the 2012 Tour de France as well as the previous year's event and the 2013 Giro d'Italia. His TUEs were approved by British authorities, and cycling's world governing body the UCI. There is no suggestion either the 36-year-old or Team Sky broke any rules. A Daily Mail investigation revealed Team Sky and Wiggins were being investigated by Ukad over the contents of the 'mystery package'. 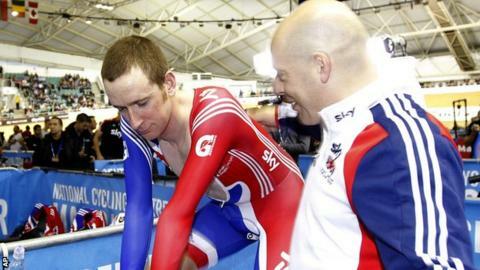 Ukad officials visited British Cycling headquarters in Manchester as part of a investigation into allegations of wrongdoing in the sport. Brailsford faced the Department for Culture, Media and Sport Committee (DCMS) hearing into doping in sport. He told MPs Freeman had told him the package contained Fluimucil. Ex-Olympic champion Nicole Cooke tells MPs she is "sceptical" of Team Sky's drug-free credentials and Wiggins' TUEs.
Ukad chief Nicole Sapstead tells MPs Freeman, who received the package, has no record of his medical treatment at the time. Freeman, who missed the select committee hearing on 2 March because of ill health, had a laptop containing medical records stolen. Moments after the letter and document were published, Team Sky board chairman Graham McWilliam tweeted his "100%" support for Brailsford, saying the board were 100% behind the team principal and looking forward to "many more years of success." "Pleased to see Team Sky challenging some of the inaccurate commentary of recent days," McWilliam added. Britain's Geraint Thomas - one of a majority of Team Sky riders to back Brailsford on Monday - says it is "annoying" that Wiggins and Freeman are not answering questions about these issues instead of the current team. "The thing is with Dave, a CEO of a company doesn't oversee everything that everyone does, you have to delegate and trust people to the head of those certain areas," Thomas told Cycling Weekly. "Freeman and Brad don't seem to be having too much of the flak, really, it just seems to be us. "We are the ones who have to stand here now and answer these questions, which we have nothing to do with." After Brailsford - until recently one of British sport's most respected figures - appeared to be on the brink, this is Team Sky's attempt to finally get a grip of a crisis that was seemed to be spiralling out of control. They will hope that the combination of contrition and defiance in this eight-page document, along with more detailed explanations of some of the questions raised by last week's incendiary parliamentary hearing, will relieve some pressure. However, Chris Froome's failure to join other riders in support of his boss (instead defiantly tweeting about his steak supper - and then a giraffe) was another PR calamity, and permanent damage to the team's reputation has been done. Brailsford must now hope there are no further revelations, or his position - already precarious - may become untenable.